DEPARTMENT OF HEALTH AWARDS BERJAYA FOR BLOOD DONATION DRIVES – Berjaya Philippines Inc.
Berjaya Philippines was conferred with the Grabriela Silang Award by the Department of Health (DOH) for its invaluable contribution to the National Voluntary Blood Services program of the Philippine Blood Center (PBC) during this year’s Dugong Bayani Awarding Ceremony held at Hotel Rembrandt, Quezon City on January 25, 2019. The annual award is DOH’s way of recognizing organizations on their commitment and support in providing safe, adequate and accessible blood for patients who need them and whose lives were saved. In the case of Berjaya, the award was given for having conducted bloodletting activities with a collection of 30 to 99 blood units per year. 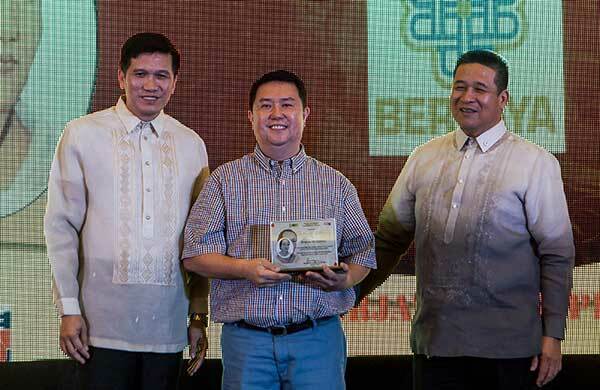 The award was presented by PBC’s Mr. Salvador Aydante, RMT and Dr. Sergio Denoga, and received by Berjaya Philippines Human Resources Director Leo Laca. Berjaya Philippines was represented by its Human Resources Director Mr. Leo Laca (center) receiving a plaque of appreciation from the Department of Health. Also shown are Mr. Salvador Aydante (left) and Dr. Sergio Denoga (right) of Philippine Blood Center. The subsidiary and affiliate companies of Berjaya Philippines actively participating in each blood donation activities are Philippine Gaming Management Corporation, Perdana Hotel Philippines Inc. (Berjaya Makati Hotel), Berjaya Pizza Philippines Inc. (Papa John’s Pizza), Ssangyong Berjaya Motors Philippines Inc., and Bermaz Auto Philippines Inc. The regular blood donors from these companies are the real heroes and they vowed to continue their volunteerism and appreciate management’s initiative in conducting this noble act of helping save lives. © 2019	Berjaya Philippines Inc.